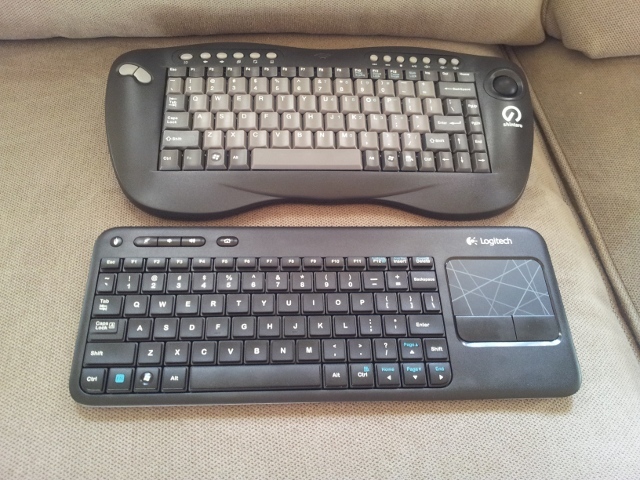 My initial reaction was that the Shintaro has a much more solid build than the Logitech. The mouse buttons were clicky and "alive", compared to the gummy feel of the K400 buttons, where you're never quite sure if you've actually pressed it. The key layout was also much better, and almost for that alone I'd take the Shintaro. 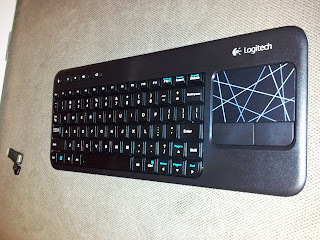 The placement of the right shift key and up arrow buttons on the Logitech continually annoyed me. The Shintaro is closer to a "normal" keyboard layout. 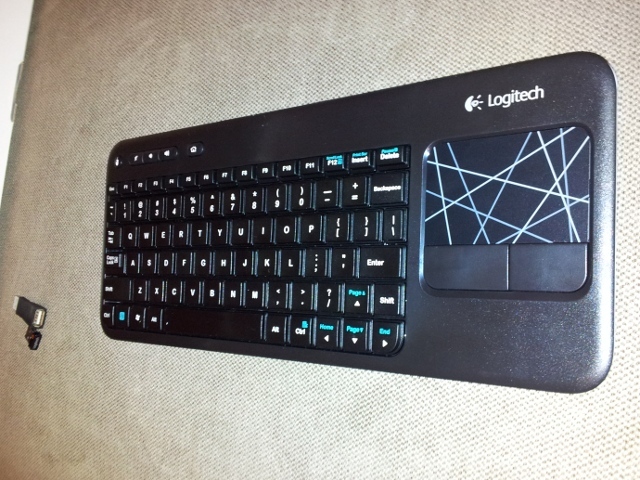 Solid feel and nice clicky buttons, has a quality about it. The keyboard layout is close to a regular desktop keyboard. Minimal pressing the wrong key when reaching into the shift/enter/arrow key area. I think I prefer the trackball to a touchpad. Size of the USB receiver. That thing is enormous. I ended up connecting it via a USB extension cable from the back of the case, because it looked so precarious hanging out the front. Wireless connectivity can perform really badly. Even with a direct line of sight and less than a metre distance, having the keyboard sitting in the wrong place on your knees can mean up to 80\% dropped characters. When it was connected it was fine, but I still haven't quite worked out what positions will cause it to go bad. (Even a direct line of sight < 3m sometimes drops the occasional character when typing). The board "goes to sleep" really quickly. Spinning the trackball doesn't wake it up either, you've got to press a key. I'm so used to bumping the mouse to wake up a computer, it takes a bit to get used to. While the build quality is nice, it is quite bulky. I sometimes had trouble getting into the BIOS with this keyboard. It has a "sync" step you have to perform by pressing a button on the receiver. I seemed to lose sync occasionally, but this may have just been the wakeup problem noted above. Takes four AA batteries, and with an estimated 3 month life, probably falls short of the Logitech in that respect. Rock solid wireless connection. I was typing thing in another room with no line of sight. Tiny USB receiver and no need to sync. Just works. 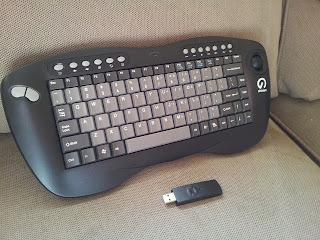 Size-wise, the keyboard is nice and compact. The flimsy build quality and gummy feel of the keys and buttons. It just felt really cheap, and was difficult to know when you'd clicked a button. Keyboard layout was problematic. In particular, the Right Shift key is much smaller than normal, with the Up Arrow taking up the space. This means the Up Arrow is easily pressed when searching for the Shift key. Doing any command-line stuff during installation, this was infuriating. The lengths of the lists don't represent who won in my test, since the negatives to the Logitech K400 and positives to the Shintaro were really big factors in my decision to keep the Shintaro.